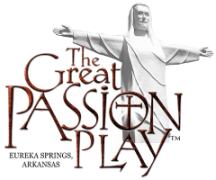 Please keep in mind that the Passion Play is the main show. We are all here to give glory to God, but the Play—Christ’s story—is what is most important. We are very glad that you are here to sing and bless us and the audience with song. You and ONE GUEST can get one free ticket to the Play, Holy Land, and Buffet. You should ask for the performer's packet at the information booth. Overall volume levels are set based on the comparative levels of the Passion Play. You will not be able to park your car behind the set for the pre-show. There are over 150 actors involved in the production and the cast parking lot gets very full. You will not be able to park in the cast parking lot and perform the pre-show without getting blocked in.